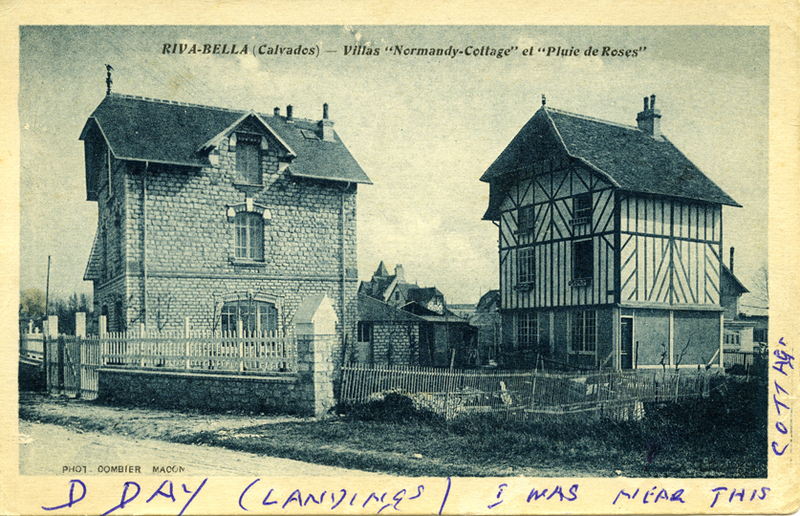 You are here: HomenextMain SubjectsnextCan you help?nextRiva-Bella (Calvados) - Villas "Normandy-Cottage" et "Pluie de Roses"
Among photographs largely of J. Pond in an album supplied by Peter Pond was this postcard. Apart from the printed title on the card a message was written on the rim that reads: D Day (LANDINGS) I WAS NEAR THIS COTTAGE. Can anybody add any more to this message, as to who wrote that? Do you know who left the message or any other information? 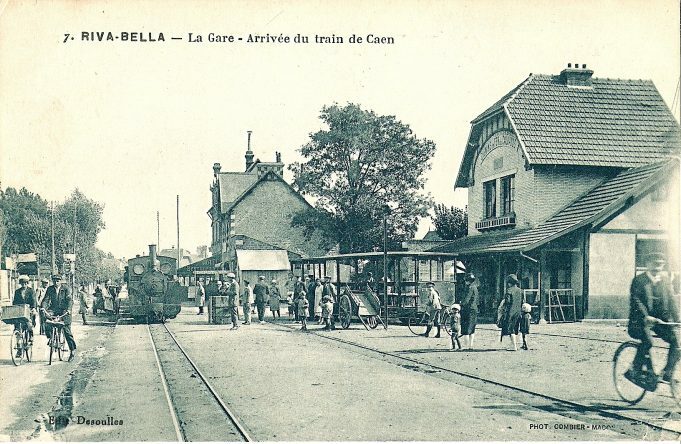 A picture from Wikipedia of the railway station. It must be at or near Ouistreham, so the D-Day connection would be accurate. My father-in-law was Alf Flack who lived at 439 Church Road, Thundersley, (Mr Pond might have known him?). He served on the landing-craft repair ship HMS Albatross at Sword, Juno and Omaha beaches until his ship was hit and forced to limp back across the Channel. He did once have a similar post-card from Ouistreham (now lost) which he obtained when he went ashore to repair beached landing-craft. I remember him saying that the French shop-keepers recovered some stock from their ruined buildings and were selling post-cards to the troops (this was two to three days after D-Day), so there must be quite a few of these old post-cards hiding in lofts and attics around Britain. And the French call us a nation of shopkeepers!